At the SAA meetings in Sacramento Guillermo de Anda mentioned evidence of offerings inside several cenotes in the northern lowlands. One of them is a cenote 2.3 km from the Castillo at Chichen Itza (it is not the famous Sacred Cenote). These Prehispanic offerings are located inside a submerged cave that can be reached from a natural platform inside the cenote. The offerings consist of human bones from at least six individuals, animal bones, coal, pottery vessels, jade beads, chert knives and round shells believed to represent Tlaloc. The objects are believed to be part of a ritual of petition for rain during the ninth and/or tenth centuries. 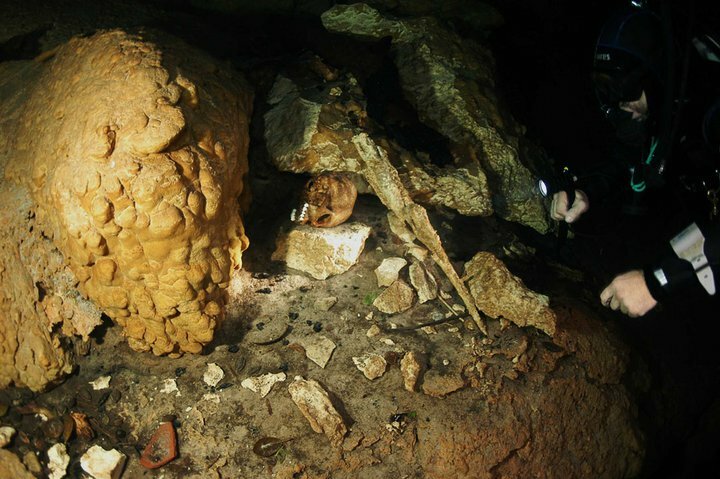 The offerings were located 5 m below the current water level in the cenote (21 m below surface), and 25 m inside the horizontal cave passage. These objects could obviously never have been deposited in such a place if they were dropped vertically down from the mouth of the cenote. They must have been placed there when the water level was 5 m lower than today. The cenote is 50 m deep and at the bottom additional human bones from roughly 20 individuals were encountered along with animal bones, ceramics, and sculptures. These were probably dropped vertically down rather than being carefully placed like the offerings in the horizontal cave. Undoubtedly these were offerings related to the extreme drought(s) that hit the lowlands. Unless the water level dropped more than down to the interior cave there would still have been a 24 m high water column inside the cenote even during the drought. Richardson Gill is mainly concerned with drinking water and I doubt that the whole cenote was emptied of water. However, the petition was most likely for rain rather than for drinking water. The crops needed the rain and although people may still have had water, their crops may have diminished at an alarming rate. I remind you about the ongoing debate between me and Stanley Guenter concerning the mega-drought hypothesis.